At Russell & Hill, PLLC, our attorneys use decades of legal experience to give personal injury victims the aggressive representation they need. Our law firm is there for clients in Spokane, Washington, whether they sustained a brain injury in a car accident or a birth injury as a result of medical malpractice. We also help people pursue compensation for medical costs and loss of income stemming from pedestrian accidents, slips and falls, dog bites, construction site hazards, professional negligence and premises liability issues. Arbitration is one of our key strengths. We understand that a trial adds even more anxiety to an already stressful situation, especially in personal injury and wrongful death cases, which is why we try to resolve matters outside of court. In one scenario, our law firm represented a client who was hurt in a three-vehicle collision on an interstate highway. The accident resulted in seven lumbar surgeries, and the defendant tried to deny liability. We were able to reach a settlement of $1.1 million in negotiations and avoid going to trial. In addition to advocating for victims of devastating personal injuries, we are there to defend people charged with crimes such as misdemeanor and felony traffic violations, DUI and drug possession. Our law firm also handles cases involving Social Security Disability and Supplemental Security Income. 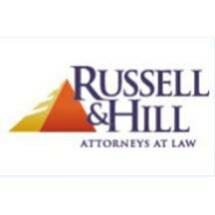 At Russell & Hill, PLLC, we offer a free initial consultation and candid case analysis to prospective clients in greater Washington and Portland, Oregon. We accept credit cards as payment for maximum expediency.